It’s time to vote for your favourite contestant to advance to the next round of Foodbuzz’s Project Food Blog. Hopefully that’s me! You’ve got until September 23rd to make your vote count and can do so right here. And for you, I’ve got a little story about food and travel! Back in university, I did a semester abroad at the University of Queensland in Brisbane, Australia. A lot of my memories from those 6 months revolve around trying new foods and seeing new places. One of my favourites finds was the New Farm Farmer’s Marke. It was there that I tried Greek yogurt for the first time, sampled wine on Saturday mornings and learned to actually enjoy eating olives. Aside from my market finds, one of my many food discoveries in Australia was the pavlova. A wonderful dessert that every Aussie I met, fiercely defended as being Australian in origin. I had no reason to doubt them at this point although I thought it a bit odd that they were so adamant that pavlova came from Australia. Fast forward 5 years and I found myself in New Zealand, once again eating and traveling around and enjoying myself immensely. That is, until one night when I was cooking with friends and the topic of what to make for dessert came up. Someone asked me if I’d had a pavlova since being in New Zealand. I foolishly replied “That’s the Australian meringue dessert, right?” Uh oh. Now Kiwi’s are generally pretty laid back people, they don’t tend to get angry very often but there’s a limit to every Kiwi’s patience and apparently I crossed the line when I dared to suggest that pavlova might come from Australia. Clearly, according to the kiwi’s I was with, it’s a Kiwi invention. Only Kiwi’s could come up with something as delicious as pavlova, not bloody Australians! Upon my return home I decided to test out my pav making skills with a bit of seasonal Canadian flavour. I topped my pavlova with a maple syrup infused whipped cream and some fresh peaches and blueberries. Maybe I can now start claiming that Canadians invented the pavlova? Preheat oven to 150 C. Using an electric mixer, beat egg whites until stiff. Add water and beat again. Add sugar very gradually while still beating. Slow beater and add vinegar, vanilla and cornflour. Line an oven try with baking paper. Draw a 22 cm circle on the baking paper. Spread the pavlova to within 2 cm of the edge of the circle, keeping the shape as round and even as possible. Smooth top surface over. 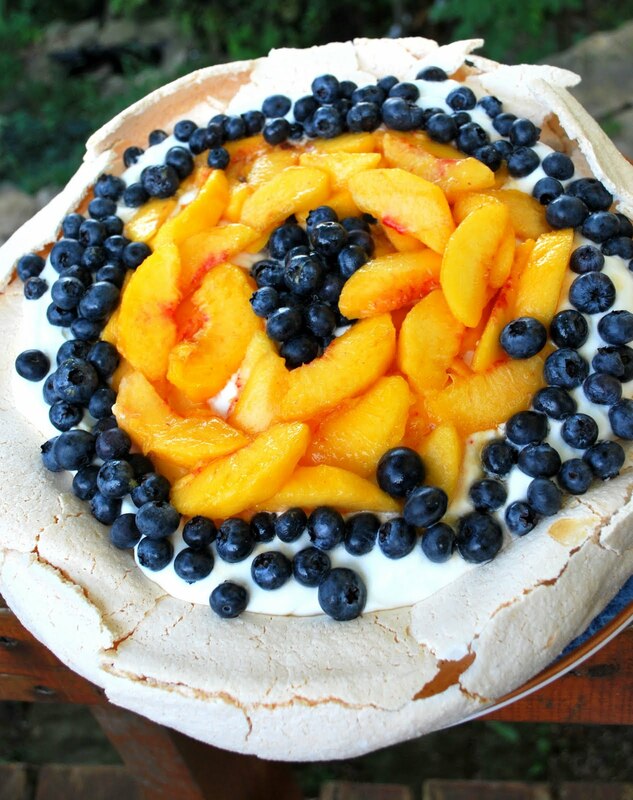 Bake pavlova for 45 mins, then leave to cool in oven (Do not open the oven while it is baking! It may deflate!). Carefully life the pavlova onto a serving plate. Decorate with whipped cream and fresh fruit. Posted by Brilynn at 7:24 p.m.
As a recent (2006) immigrant to New Zealand from California, I've watched the pavlova debate with interest. Pavola, as many Australiasian foods, seems to have had a cross-Tasman history. Pavlova, according to the 2001 edition of Larousse Gastronomique, was named after the 1929 visit of Anna Pavlova to Australia and indicates the dish first won a newspaper prize in New Zealand; however, the recipe was perfected by Bert Sachse in Perth, Australia. The Oxford Companion to Food, 2006, provides some additional information on the subject. They indicate that according to the Austalian claim, pavlova was invented in 1935 by Herbert Sachse (as does Larousse Gastronomique) after the 1926 visit of Anna Pavlova; Australian author Symons indicates "the actual product had made a prior appearance in New Zealand, but suggests its naming was an Australian act." 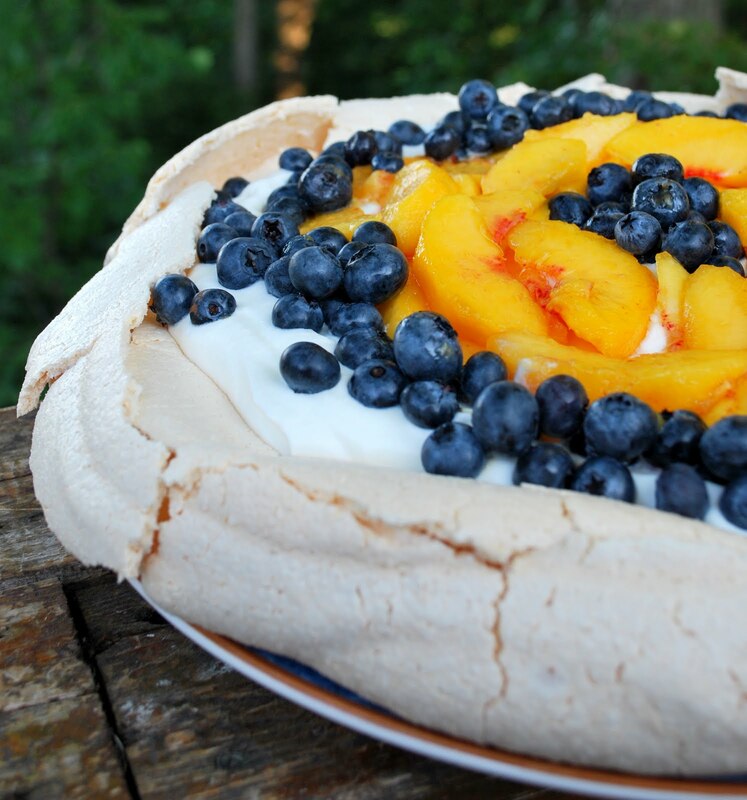 The author says, "The built-up sides of the pavlova are said to suggest a tutu." The Oxford Companion to Food goes on to say Helen Leach has shown evidence that "the large soft-centred meringue cake which is the pavlova had been developed in New Zealand by 1934 (or possibly earlier), although it was not at first called pavlova; but, the name and the dish were put together in New Zealand at some time before 1935, thus antedating the Australian activity." In "First Catch Your Weka," (2008) David Veart quotes a now broken Te Ara Encyclopedia of New Zealand link which suggests "the recipe being copied from a New Zealand magazine and popularised by an Australian." David Veart goes on to say that he has in his personal cookbook collection a 1929 cookbook called "Cookery Chats and Recipes" by Katrine Mackay which bears the name pavlova, as well as a very similar recipe for "Pavlova Cakes" which appeared probably the same year in the "New Zealand Women's Household Guide. David Burton, in his book "Two Hundred Years of New Zealand Food & Cookery" (1982) suggests that in 1926 a "pavlova recipe appeared in a book entitled 'Home Cookery for New Zealand' (although it went under the name of 'Meringue with Fruit Filling') and that another recipe actually called 'Pavlova' was published the following year. Burton goes on to suggest that "Certainly the classic kiwifruit (Chinese gooseberry) topping which the Australians have also adopted must belong to New Zealand. Pavolva always reminds me of "down under". PS I voted for you...I know you will come out a winner! One of my fave desserts, and you've served this one up in style! It's beautiful! !Good luck for the PFB. Off to vote for you!! Your version of a Pavlova sounds perfect. And if it tastes as good as it looks, I don't really care where it was invented. I dub this pav Canadaian! Whatever its nationality, pav is fab. Tasty treat indeed :)found you on food buzz. .great! Great information in this post and I think a wonderful dessert that every Aussie I met, fiercely defended as being Australian in origin. I had no reason to doubt them at this point although I thought it a bit odd that they were so adamant that pavlova came from Australia.